3D Golden Pearl Flower Gravity Theme Download and Enjoy Its!! The joyful 3D Golden ⚪️Pearl Flowe💐r Gravity Theme with a playful Golden Color ⚪️Pearl and Flowers wallpaper will be one of the supreme lovely Golden themes will bring your phone screen a brand lovable new look. 💖 The 3D Golden Pearl Flower💐 Gravity Theme with incredible interesting interactions & joyful 3D Gravity effect will make your phone screen look more lovely & affectionate. 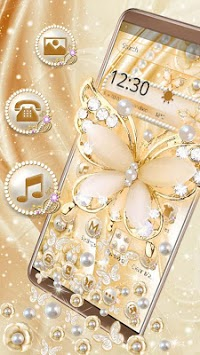 ⚪️ The Golden Pearl theme launcher offers 3D Golden Pearl Flower wallpaper & lovable Pearl icons. ⚪️ Impressive Gravity effects & interesting interactive interactions. ⚪️ Download the affectionate 3D Golden Pearl Flower theme to own Pearls icons , 3D Golden Pearl Flower wallpapers and tons of supreme fantastic 3D Golden Luxury themes. 💖 With The 3D Golden Pearl💐 Flower Gravity Theme, you can enjoy the these incredible interactions, just like a education simulation game. 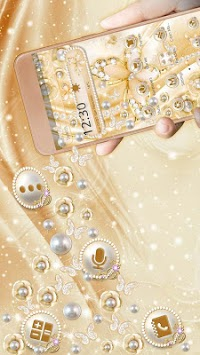 💖 3D Golden Pearl Flower 💖 Gravity Theme is a new free Golden Pearl theme among tons of incredible Golden Luxury themes. We are a creative team, and always make great efforts to create more extraordinary Gravity Theme for you. 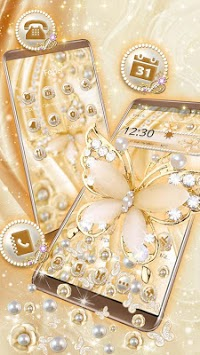 💖 3D Golden Pearl 💐Flower Gravity Theme is a free Luxury theme specially designed for our launcher users, including dozens of superlative Golden Pearl icons and lovely Golden Flower wallpaper/background, which can Personalize your phones easily. Notice: The lovable 3D Golden Pearl Flower Gravity Theme is only available for phones with our launcher installed. 🔶 Start our launcher and then you can apply the affectionate animal theme you downloaded. If you already have our launcher on your phone, you can also directly go to “Themes--Mine” to open the Luxury Golden Pearl theme and apply it to your phone. If you like👍🏻 the 3D Golden Pearl Flower Gravity Theme, please support us by rating it.